During his extended photo op in Flint Michigan Donald Trump took the time to visit and speak at a black church, Bethel United Methodist. During his speech he made the mistake of getting political and the church's pastor, Rev. Faith Green Timmons shut him down quick by reminding him that he there to address the Flint water crises. Watch that moment below. I blame the church that allowed him in there....they knew better. They must be watchful over the flock and a wolf was allowed to come in and stand over them. 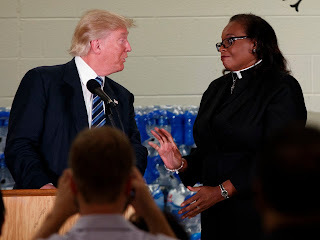 It must have been unavailable for trump to have a Black Woman tell him what he could not say. After all WHAT DO YOU HAVE TO LOSE??? ?